I still encounter people who believe that animals are “just stupid animals” and I can’t figure it out. You can try to argue with those humans, in the past I’ve tried, but humans aren’t the brightest in the animal kingdom. They will oddly use their glorious prefrontal cortex for ignoble pursuits such as insisting that long-held, outdated beliefs are true, even in light of a plethora of YouTube evidence (not to mention, actual scientific evidence) to the contrary. Humans are funny that way. Well, not so much funny as sad. That’s one of the reasons it always makes me so happy when I come across articles like the one I recently encountered headlined Cockatoos Learn To Make Tools By Watching Their Friends by Jason G. Goldman. “More than fifty years ago, humans were pretty well convinced that they were special, different from the rest of the animal kingdom. That all changed in 1964 when Jane Goodall reported her observations of tool use in chimpanzees. 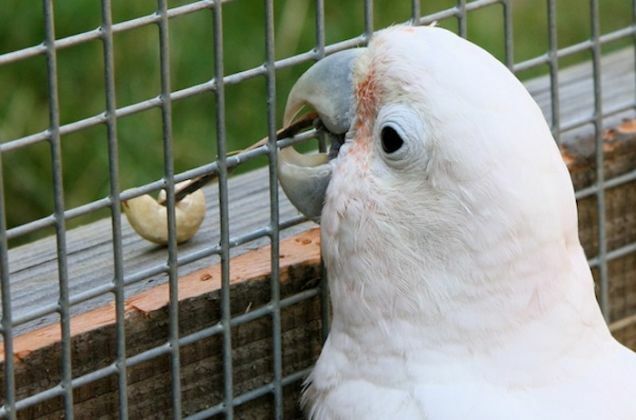 Now we have evidence that Goffin’s cockatoos, parrots that don’t use tools in the wild, have the cognitive capacity to learn to manufacture, modify, and use tools anyway.